Courtesy of Mostly Postcard Inc. The only active amethyst mine in North America is nestled in the four peaks of the Mazatzal Mountains, 40 miles northeast of Phoenix, Arizona. This 20-acre mine site is gated and trespassing is prohibited. Due to the mines remote location, supplies for the miners must be flown in by helicopter. Once you know me, you’ll know that I’m a rockhound. I not only have a love affair with Arizona, but am intrigued by its minerals, rocks and awesome earth formations. We’re, of course, well-known for our Grand Canyon, which is the grandest of them all, but we also have many, many others unlike any in the world. We have some very clear skies, too, which means pondering the Universe. The best way to do that is through some of the observatories and astrology clubs. Thanks so much for checking for info about the prize! I thought and thought, and then decided to share some of the love I have for Arizona with you in the way of an amethyst, which is indigenous to our area. Since Relocation is my forte, I use rocks and minerals as my housewarming gifts. My colleagues are important, too, so hope you enjoy this “rock” from me. Rocks and minerals: Start with the Arizona Mines and Minerals in downtown Phoenix. Huge displays with data and information and how, why, and where they came from. Arizona is known as the Copper state, (also silver and gold) but there is much, more in the way of minerals, such as amethyst (the Four Peaks Mine) and the Purple Passion Mine, peridot (my birthstone), and; well, I’ll let you discover them in the following sites and places. We’ll start with Copper, and its famous mines in Arizona, and their cities, Bisbee, Clifton and Morenci. With copper comes three other beautiful minerals, malachite (rich greens) and azurite (royal blue) (see also azurite mineral and turquoise (sea green). Phelps Dodge Morenci mine, remains the second largest copper producer in North America and the sixth largest in the world. Asarco has tours and a mineral discovery center. There are plenty of mines to visit that are in the ghost towns, or closed mines, like the Copper Queen Mine in Bisbee and Jerome. There are more than 35 varieties of quartz alone, amethyst, citrine, agate, jasper. What makes minerals fascinating is that they often develop in red-hot fluids, each with their own chemical makeup and shape. Perfect cubes, such as in pyrite, cylinders as in quartz, prisms as in emeralds, and others crystallize in evaporating desert lakes, such as gypsum and selenite. This year’s “ball” for New Year’s (2006) was a selenite “rose”. Check it out! And don’t forget those rocks that formed when lava cooled too quickly for crystals to grow. Obsidian (jet black) or Apache Tears, litter the ground in some areas, and are what early settlers shaped into arrowheads and blades for hunting. Take a peek at some of these minerals on these local sites. The Mineralogical Society of Arizona and Bob’s Rock Shop and visit the Geological Sciences Center at ASU, Arizona State University. ASU has great undergraduate and graduate programs. At Arizona State University, there are numerous researchers involved in a wide variety of studies of meteorites and they have a meteor from Mars to show you. Of course, we have a very famous Meteor Crater and Barringer Crater right here in Arizona. Arizona Archaeological Society Enjoy classes about the Prehistory of the Southwest, and learn facts about past native cultures, including the Anasazi and the Hohokam. Arizona is among the few places in the world with rare relative of lead, wulfenite (gorgeous gold/orange color), is found. Then there’s gold… the Superstition Mountains was named after a prospector who claimed to have hidden his lode in them thar mountains. My boys and I took a llama trek there a couple of years ago, but we didn’t find any. However, there has been gold found here, (remember the cry, Go West, Young Man!) and the Arizona Mines and Minerals Museum has a great collection, from nuggets to dust. And that dust costs money, too! You may discover some of these minerals as you’re hiking and camping. Fossils, too! And dinosaur tracks My son found a rock camping near Globe that the Arizona Mines and Minerals geologist identified as 300 million years old. What a gift! A famous fossil collection is wood! The Petrified Forest in northern Arizona is the place to visit. For a long list of the many Mineral and Gem shows in Arizona, the biggest of which is the Tucson Gem and Mineral Show, check out this list. Should you become a budding “rockhound” and want to know where to explore, check out this list of Rockhound and Tourist Information. For more information onrockhounding in Arizona, contact the Arizona Department of Mineral Resources at 602-255-3791. Geodes are formed in a cavity, such as those found inside a fossil shell buried in sediment. Most geodes are partially filled with mineral matter. They have a thin layer of wavy quartz covering and an inner lining of inward projecting crystals. These spectacular crystals, generally quartz, or less often, calcite, make geodes highly prized by collectors. Some of the formations in Arizona are world famous. All are stunning. For a scenic tour, here are some of them. Stargazing is another favorite pastime in Arizona. Arizona’s dry weather and clear skies make it a prime spot for amateur astronomers. Because of this, we have many Astronomy Clubs. 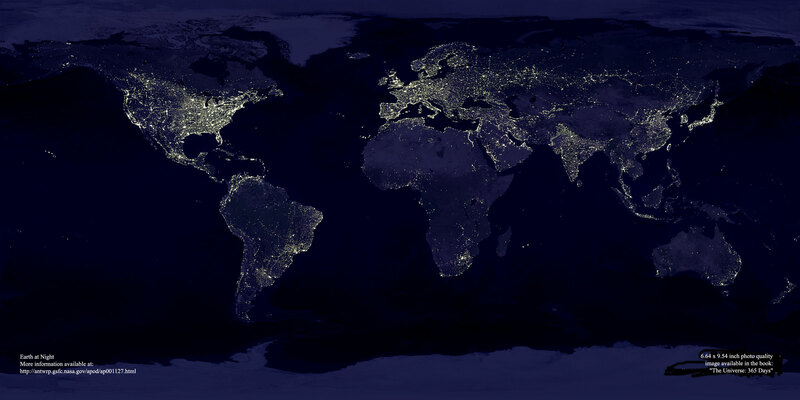 Earth from space – do we really light up! Have trouble remembering the planets’ order from the sun? Arizona Science Center, 600 E. Washington St., Phoenix 602-716-2000.